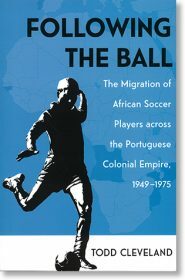 On February 26, Todd Cleveland joined us for a discussion of his book, Following the Ball: The Migration of African Soccer Players across the Portuguese Colonial Empire, 1949-1975 (Ohio University Press, 2017). Cleveland grappled with questions about different aspects of his multifaceted and player-centered history of migration to Portugal from African colonies such as Mozambique and Angola. Cleveland, a social and labor historian of Africa at the University of Arkansas, explained his use of archival and oral sources, and stressed how African soccer migrants, despite many challenges under colonial rule, managed to find ways to negotiate a better life for themselves in Portugal. Participants included: Danyel Reiche, Martha Saavedra, Michelle Sikes, Jacob Fredericks, Tianyi “Titi” Kou, Andrew Guest, and Peter Alegi. Below is an audio recording of the session.